What do we talk about when we talk about war? We analyse geopolitics, we fear the worst. We spend in ‘defence’. But we are all, in reality, defenceless. Some salute the army national parades. Some don’t. Some admire the high-tech weaponry. Some don’t. We join armies. We raise our voices in defence of peace. We keep silent, when we shouldn’t have. We sign pacts. We engage in dialogues. We write resolutions. We rarely respect them. We keep friends close. We keep enemies closer. We are the good guys. We are the bad. But when shall we realise that we are one? We wash humanity out of the planet. We wash, we somewhat recover, we repeat. We invade each other. We think of brutality when we think of war. And a brutality it is. Humanity going backwards. Again and again and again. And those of us who are lucky to survive a war, live to tell the story. People like George. Today, he lives in London with his wife and two sons. Fully creative, peaceful and balanced, he engages in book writing, design and distribution of educational products for children, and property development activities. I was born on May 27, 1967 in London, where we spent the first five years of my life. Just before my fifth birthday, my father sold all of our possessions and our journey back to his motherland begun. It was my father's dream to return to Cyprus ('one day') to raise the family there, that put us on the road with his Ithaca as a final destination. I remember sitting in the back seat of this huge American car with my sister on the other end of the seat, driving through Europe. I was staring out of the window feeling very excited. On our arrival to the island, we drove straight to our village, Asha, where my grandparents had lived their whole lives and where my dad was born. I felt at home from day one, and it wasn't long before the whole village knew me. 'Hello George!' they would say, warmly welcoming me everywhere I went, 'The kid is Koutalianos' grandson!' they would sometimes explain to each other... and I would smile and wave back. My dad had some land in the village and he wanted to build a house for us, so after a few months in the village, we moved to Nicosia, while the house was getting built and I would be put on the bus straight to Asha every morning to attend school. It was not long before I forgot my English and spoke and wrote fluent Greek. In June 1973, my mum gave birth to my brother, our house was nearly finished, and my life was blissful. I would spend my free time with the local shepherds, looking after their animals and playing with new-born lambs and spending time with my friends, hunting for birds with our self made rubber catapult toys. Early in 1974, our house was almost ready too. My father's dream was finally coming together. My mum had furnished it beautifully and we moved in, in excitement for the new beginnings - the fruit of my parents' struggles . Just two weeks down the timeline, my country was invaded by Turkish military and my village was - and still is- occupied. This is where my childhood was blown up to a million pieces. The war started and the next thing I remember was having to go to my grandmother's house with my mum, my brother and my sister, while my dad had to go with the other local men to the hills. I could not really understand what was going on, until the day that the first bombarding began, a few miles away and the whole house shook. My curiosity got the better of me and I sneaked out to see. I was fed up of spending my days in darkness. I watched as Turkish planes would fly low and I could hear the sound of their machine guns. My uncle, who lived in the village of Vrisoulles, located near Famagusta, came to find us because he lived nearby the British Sovereign Base--he had inside information that things would get worse. We were told to head to the British Sovereign Base, in Dhekelia area - the British passports we still had were enabling us to eventually leave the warzone under the auspices of the United Kingdom. Food was very scarce and everyone was on rations. The only thing keeping me positively occupied was the nearby beach where I could play and collect little sea shells. From there, we were air lifted by an army cargo plane to Akrotiri. After a few days we were out in a Dc-9 aeroplane and flown to England. Even during this time, we all thought that we would return to our house soon and that all this would settle. On the 14th of August 1974, a few weeks after we arrived in England, news came to us that Asha had fallen to the Turks and many people were missing. It was the first time I saw my father crying. I couldn't understand how or why we couldn't go back to Cyprus and live in the village I loved but, as time went by it hit me that we had lost everything. We had no option but to stay with my mum's parents in North London. It's now September of 1974 and I am being taken to a new school at a place that I am not familiar with. I am scared and confused. I have no friends, no family and I cannot speak any English at all. Everything is foreign to me. I'm the 'alien' on this planet where I now walk on and I can hardly breathe its oxygen. The bell rang in school for us to go to our classes and I was crying. It was truly one of the scariest times of my life. I looked around the school playground and all I could see were walls and metal 'prison-like' gates. I ran up to the gate and tried to climb over. Thank God a teacher saw me as I would have got lost. She took me to my class and everyone just stared at me. I remember the teacher talking to me but I could not understand anything so she gave me a piece of paper with a sentence on it and explained with sign language what to do. I had to write the sentence down, over and over all day. It said 'God help you and your family'! After a year or so, I began adjusting into that nightmare and the next thing I know we moved out of my grandparents house to a new area. My dad had borrowed some money from a friend and opened a dry-cleaner's shop. We lived on top of the shop in a very rough part of London, and to make things worse, I had to change school again. It was all so traumatic for me at the age of eight years old. I had to look after my sister who was six and my one year old brother, while my parents worked downstairs seven days a week. The area we lived in was mainly Jamaican, Irish and English and only a handful of Greeks. I was somewhere stuck in the middle. I longed to have Greek people around me, but all the relatives in England lived miles away. I didn't fit in at all and suffered in silence. Not once in all my years has the whole heartache of the war and the immense changes it brought to my childhood has ever left me and, I guess, I will always feel a foreigner in any country apart from Cyprus. Going back to the war, it has scarred me for life, it takes away your identity when your land has been taken and you live in a foreign country. It contributes to an overwhelming feeling of hopelessness and sorrowful loss. Being a child living through a war hits you later on in life when all the circumstances you faced and the feelings of fear come to the surface. 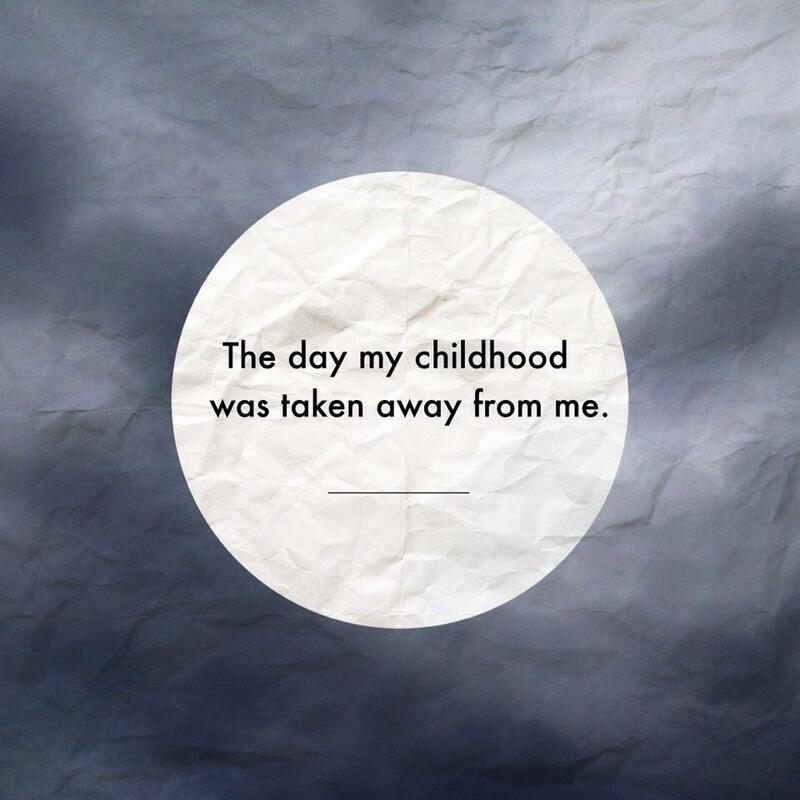 It is no wonder that eight years ago I completely broke down, because my childhood was taken away from me. Depression took its toll and it lasted six years of therapy, medication and pain. I also believe that being a very deep person worked against me at the time, but having been through all of this and coming out stronger ,I have embraced it and it motivates me to help others in whatever capacity I can.